New growth is a pure white which turns yellow, then green, as it matures. 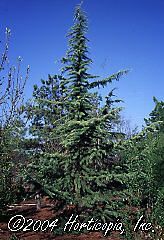 Grows as a low, spreading small tree to 10' at maturity. Full sun.